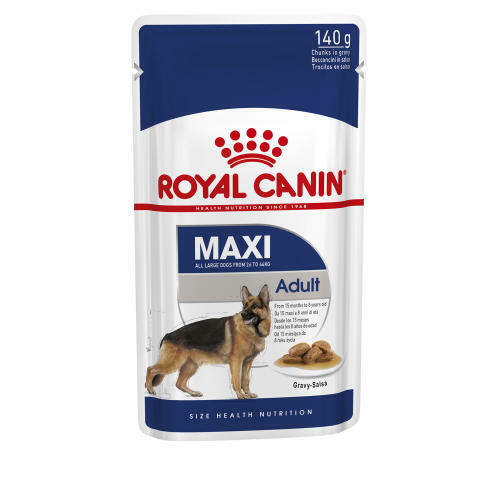 ROYAL CANIN Maxi Adult Wet Dog Food Pouches are sure to keep tails wagging! This is complete wet food for adult large breed dogs (from 26-44kg) from 15 months to 8 years old. Highly digestible with bone and joint support and Omega 3 EPA and DHA for skin and coat. Omega 3: EPA-DHA - Enriched with omega-3 fatty acids (EPA-DHA) to help maintain healthy skin. Composition: Meat and animal derivatives, oils and fats, cereals, vegetable protein extracts, derivatives of vegetable origin, minerals, yeasts, various sugars, molluscs and crustaceans Crude ash: 1.5%. Crude fibre: 1.4%. Crude oil fats: 5.5%. Moisture: 81%. Protein: 7.5%. Please see image for feeding guidelines.